I always plan every dinner party around dessert and Passover Seder is no exception. This year, in addition to the usual suspects of a flourless chocolate souffle cake (from Room for Dessert by David Lebovitz), coconut macaroons (from a recipe published in The New York Times a few years ago), and caramel matzoh crunch (just the very best, most brilliant Passover dessert ever, pictured below with matzos cookies) I wanted to bake something from The Settlement Cook Book for a couple of reasons, not least of which is that I work at New York's most venerable settlement house, Henry Street Settlement. Henry Street is not affiliated with the book, which was written by Mrs. Simon Kander, the head of a Milwaukee settlement house in 1901. (Cliff note: Settlement houses, most founded around 1900, provide social services to improve the lives of immigrants. 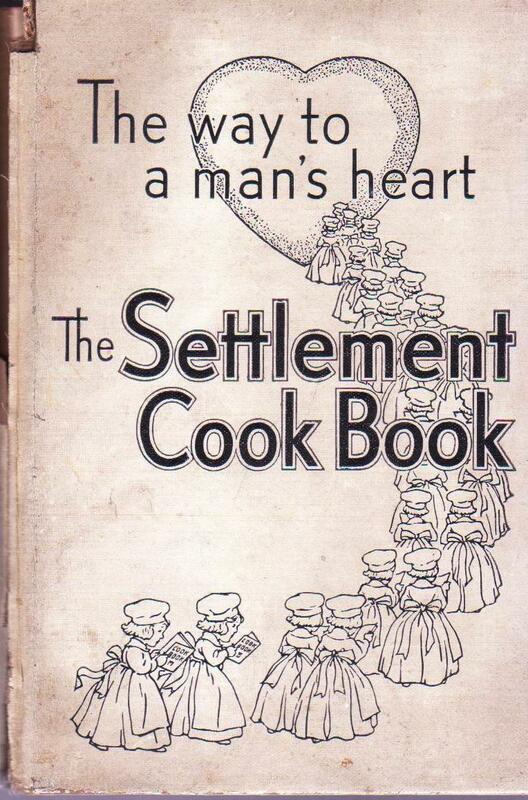 And I'll be writing more about very interesting Settlement Cook Book in a future post.) The edition I use, one "borrowed" from my mother's bookshelf a few years ago, is from 1953. I was planning to make a recipe from the book called "Kiss or Schaum Torte," which is basically a big, round meringue filled with fresh whipped cream and fruit. I imagined it the perfect (if not Kosher) light ending to the traditional very heavy meal. But it was not to be because, if I've learned anything it's that weather, especially humidity, can determine baking success or failure. And because it was raining in New York on Tuesday, I knew the torte would never set up properly, and few things in life are more disappointing than a damp meringue. Instead, I made "Matzos Cookies." These are simple -- if you don't follow the instructions to roll the dough and cut with a cookie cutter. The batter is soooo sticky that trying to roll it is an exercise in frustration. After doing battle with the dough (and employing my secret weapons of Silpat, a miracle non-stick mat, a French rolling pin covered with a non-stick stocking and an offset spatula), I was about to surrender the whole mess to the trash. 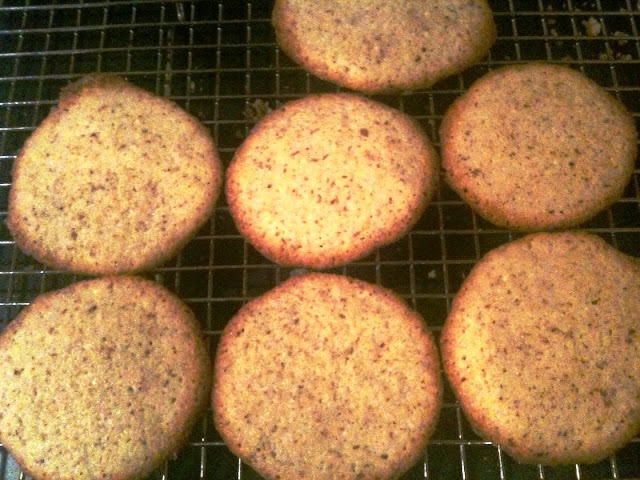 In a last ditch effort to save the batter (for it was quite delicious raw), I dropped small balls of dough onto the parchment paper-lined cookie sheet and popped it in the oven. I watched as, like in a time-lapse film, the roughly shaped balls "melted" into perfect circles from the heat of the oven. 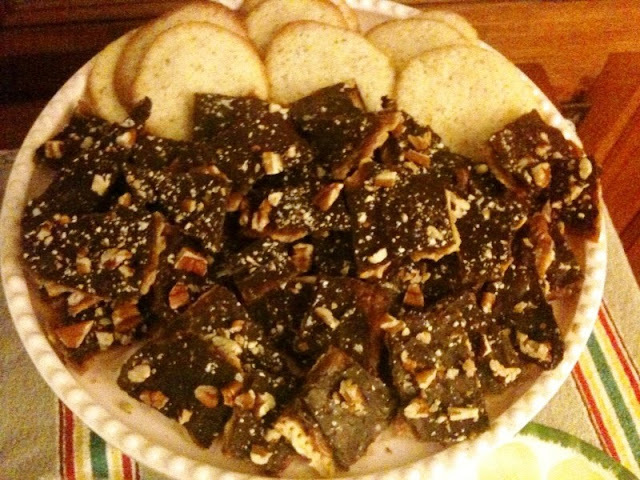 These cookies were devoured at the Seder. They are very unusual, sort of gritty (in a pleasing way) on account of the almonds and matzoh meal, very sweet and almost addicting. While they will never rival caramel matzoh crunch, their simplicity and unique character have earned them a place at my Passover table. Cream butter and sugar, add the rest. 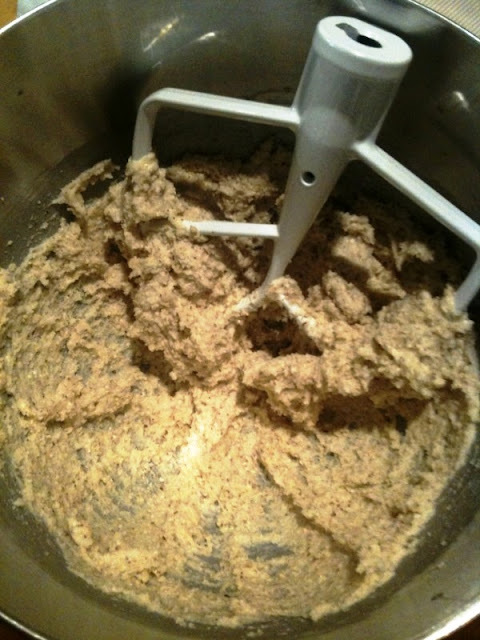 Gather dough in a flattened ball and place in refrigerator for at least an hour. Pull of pieces of dough and drop on baking sheet. Bake about 10 minutes (keep checking) in a 375 degree oven. Remove when the edges begin to turn golden brown. 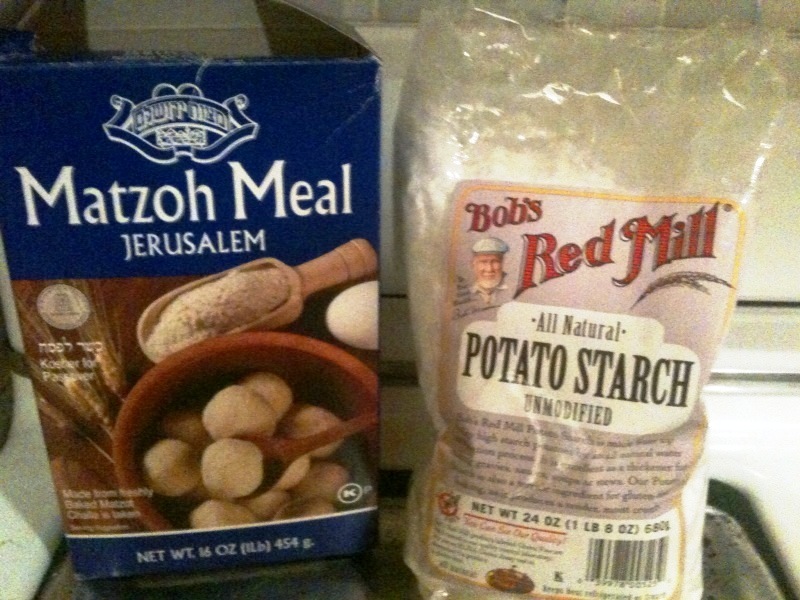 *I couldn't find anything called potato flour, so I used potato starch. Worked just fine. Wow! Those look um...interesting. Next year, for sure. Thanks. Of course it's good; it's my MOTHER'S!